(The fourth Lexington (CV-2) was originally designated CC-1, laid downas a battle cruiser 8 January 1921 by Fore River Shipbuilding Co., Quincy,Mass., authorized to be completed as an aircraft carrier 1 July 1922; launched3 October 1925; sponsored by Mrs. Theodore Douglas Robinson, wife of theAssistant Secretary of the Navy, and commissioned 14 December 1927, Capt.Albert W. Marshall in command. After fitting out and shakedown, Lexington joined the battle fleet atSan Pedro, Calif., 7 April 1928. Based there she operated on the west coastwith Aircraft Squadrons, Battle Fleet, in flight training, tactical exercises,and battle problems. Each year she participated in fleet maneuvers in theHawaiians, in the Caribbean, off the Panama Canal Zone, and in the easternPacific. In the fall of 1941 she sailed with the battle force to the Hawaiiansfor tactical exercises. On 7 December 1941 Lexington was at sea with TF 12 carrying marine aircraftfrom Pearl Harbor to reinforce Midway when word of the Japanese attack onPearl Harbor was received. She immediately launched searchplanes to huntfor the Japanese fleet, and at midmorning headed south to rendezvous withIndianapolis and Enterprise task forces to conduct a search southwest ofOahu until returning Pearl Harbor 13 December. Lexington sailed next day to raid Japanese forces on Jaluit to relievepressure on Wake; these orders were canceled 20 December, and she was directedto cover the Saratoga force in reinforcing Wake. When the island fell 23December. the two carrier forces were recalled to Pearl Harbor, arriving27 December. Lexington patrolled to block enemy raids in the Oahu Johnston-Palmyratriangle until 11 January 1942, when she sailed from Pearl Harbor as flagshipfor Vice Adm. Wilson Brown commanding TF 11. On 16 February, the force headedfor an attack on Rabaul, New Britain scheduled for 21 February, while approachingthe day previous, Lexington was attacked by two waves of enemy aircraft,nine planes to a wave. The carrier's own combat air patrol and antiaircraftfire splashed 17 of the attackers. During a single sortie Lt. E. H. (Butch)O'Hare won the Medal of Honor by downing five planes. Her offensive patrols in the Coral Sea continued until 6 March, whenshe rendezvoused with Yorktown's TF 17 for a thoroughly successful surpriseattack flown over the Owen Stanley mountains of New Guinea to inflict heavydamage on shipping and installations at Salamana and Lae 10 March. She nowreturned to Pearl Harbor arriving 26 March. Lexington's task force sortied from Pearl Harbor 15 April, rejoiningTF 17 on 1 May. As Japanese fleet concentrations threatening the Coral Sea were observed, Lexington and Yorktown moved into the sea to search for theenemy's force covering a projected troop movement the Japanese must now he blocked in their southward expansion, or sea communication with Australia and New Zealand would be cut, and the dominionsthreatened with invasion. 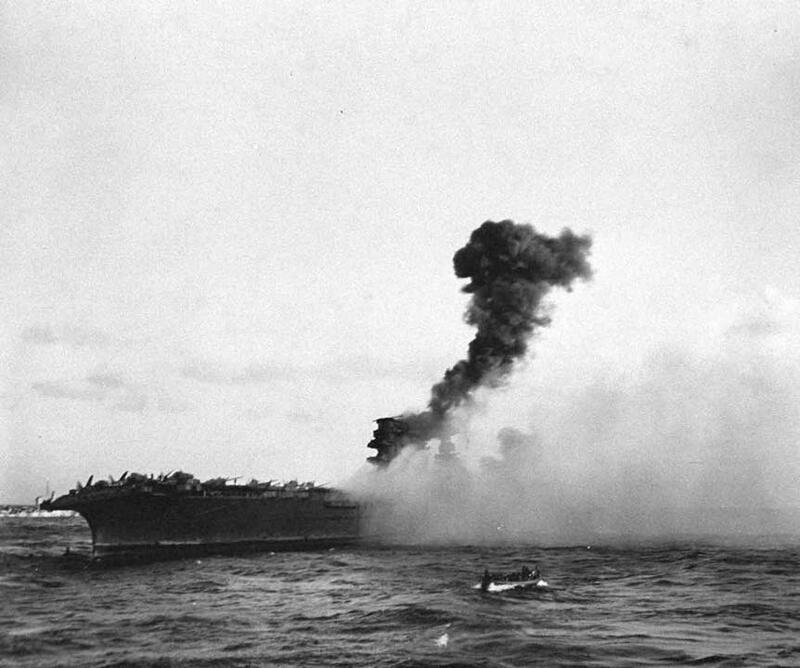 On 7 May search planes reported contact with an enemy carrier task force,and Lexington's air group flew an eminently successful mission against it,sinking light carrier Shoho. Later that day, 12 bombers and 15 torpedo planesfrom still unlocated heavy carriers Shokaku and Zuikoku were interceptedby fighter groups from Lexington and Yorktown, who splashed nine enemy aircraft. On the morning of the 8th, a Lexington plane located Shoksku group; astrike was immediately launched from the American carriers, and the Japanese ship heavily damaged. The enemy penetrated to the American carriers at 1100, and 20 minuteslater Lexington was struck by a torpedo to port. Seconds later, a secondtorpedo hit to port directly abreast the bridge. At the same time, she tookthree bomb hits from enemy dive bombers, producing a 7? list to portand several raging fires. By 1300 her skilled damage control parties hadbrought the fires under control and returned the ship to even keel; making25 knots, she was ready to recover her air group. Then suddenly Lexington was shaken by a tremendous explosion, caused by the ignition of gasoline vapors below, and again fire raged out of control. At 1508 Capt. FrederickC. Sherman, fearing for the safety of men working below, secured salvage operations, and ordered all hands to the flight deck. At 1707, he ordered,"abandon ship! ", and the orderly disembarkation began, men going over the side into the warm water, almost immediately to be picked up bynearby cruisers and destroyers. Admiral Fitch and his staff transferredto cruiser Minneapolis, Captain Sherman and his executive officer, Comdr.M. T. Seligman insured all their men were safe, then were the last to leave their ship. Lexington blazed on, flames shooting hundreds of feet into the air. DestroyerPAclp~ closed to 1500 yards and fired two torpedoes into her hull, with one last heavy explosion, the gallant Lexington sank at 1956, in 15?20'S. 1oo?30' E. She was part of the price that was paid to halt the Japaneseoversee empire and safeguard Australia and New Zealand, but perhaps an equallygreat contribution had been her pioneer role in developing the naval aviatorsand the techniques which played so vital a role in ultimate victory in thePacific. Lexington received two battle stars for World War II service.